An obscure JRPG that follows the pre-teen owner of an item shop has become a hit thanks to digital distribution. Digital distribution has once again proven itself as a platform that can help the smaller guys, and more off-beat titles, survive. 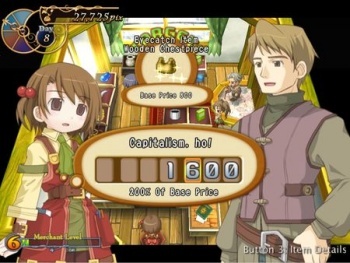 Not long after Zeboyd Games revealed that its $1 indie RPG was a success on Xbox Live, localization group Carpe Fulgur has announced that its similarly niche RPG Recettear: An Item Shop's Tale is a hit one month after being released on Steam, Gamers Gate, and Impulse. Notably, Recettear is the first independently made title from Japan to be released on Steam. This experiment has apparently been a success, because Carpe Fulgur says Recettear has sold 26,000 copies (between all distributors) in three weeks of sales and one week of pre-orders. And that number is continuing to grow. At $19.99, Recettear wasn't exactly an easy sell as a title developed by Japanese studio EasyGameStation and completely unknown to anyone outside of Japan until recently. Players take on the role of a little girl that is forced to run an item shop to pay back a loan of her father's. While managing multiple aspects of the shop, players also control various different adventures in randomized dungeon crawls. As usual, 26,000 might not sound like a lot. However, due to being sold on platforms like Steam, Carpe Fulgur says: "Recettear has done what we had barely dared to hope it would do: in a month it has secured the future of Carpe Fulgur by allowing all of its members to make wages comparable to 'proper' jobs in the industry for an entire year." The company says they are now able to "continue with other projects with very little concern for the immediate future," and plans to localize more Japanese titles for overseas audiences. Combine these two successes with even bigger stories such as the Minecraft developer making $350,000 a day, and I don't think anybody has to worry about more unique titles being swallowed up by big-budget run-of-the-mill games anytime soon. For those of us that enjoy games that don't necessarily appeal directly to the mainstream, this is a very good thing indeed.